75522C is rated 4.8 out of 5 by 4. While other products may gather unsightly mineral build-up over time, Delta soft rubber Touch-Clean® spray holes allow any mineral residue to simply be wiped away for an instantly refreshed look – with no need for soaking or the aid of chemical cleaners. The pause setting gives you ample space for shaving, lathering and other shower tasks, without worrying about overspray or water waste. This spray setting helps you conserve water, so you can worry less about depleting your supply of hot water - and you help the environment too. Delta WaterSense labeled faucets, showers and toilets use at least 20% less water than the industry standard—saving you money without compromising performance. Rated 4 out of 5 by Martin from Good Value Attractive and well made head. Hose is somewhat rigid and fails to hang loose. Rated 5 out of 5 by Rich from Worked as promised The shower head/hose works well and even with the lower flow rate does a good job plus is very quiet. Kohler no longer makes hand held shower heads in polished brass. 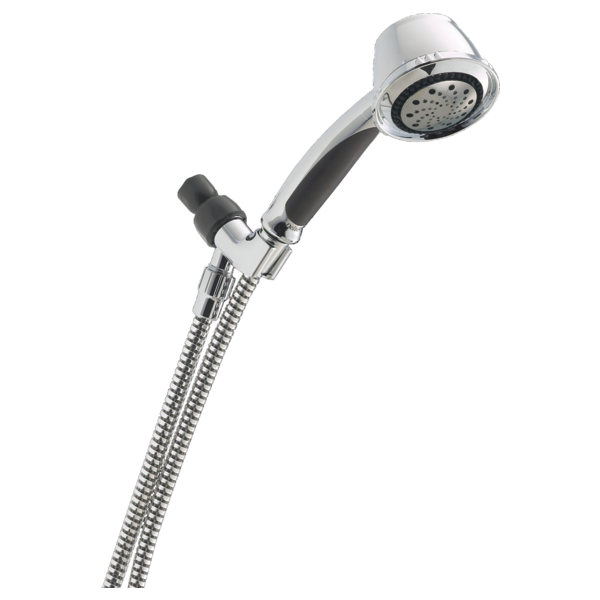 Would this shower head work with a Kohler hose? Do you have the spec sheet on the material this is made from ? &nbsp;I don&rsquo;t want plastic and there are no specs on your web site that i can find.